China (中国; Zhōngguó), officially known as the People's Republic of China (中华人民共和国 Zhōnghuá Rénmín Gònghéguó) is a huge country in Eastern Asia (about the same size as the United States of America) with the world's largest population. With coasts on the East China Sea, Korea Bay, Yellow Sea, and South China Sea, in total it borders 14 nations. It borders Afghanistan, Pakistan (through the disputed territory of Kashmir), India, Nepal, Bhutan, Myanmar, Laos and Vietnam to the south; Tajikistan, Kazakhstan and Kyrgyzstan to the west; Russia and Mongolia to the north and North Korea to the east. This number of neighbouring states is equalled only by China's vast neighbour to the north, Russia. Macau maritime Museum is built on that site where the first group of the Portuguese explorers landed on Macau in the year 1553. It occupies an area of about 800 square meters. It was enlarged in the year 1990 and this museum follows the typical layout of museum of European style. The exhibits explore the major themes on the history of the maritime industry in Macau, Portugal and China. The main building of Macau Maritime Museum is three-storey white building which is architecture in the shape of a boat in a full sail. Big windows of glass providing an illusion of the observation tower of a boat. This museum building from a distance appears like a majestic boat which is anchoring at the tranquil port. This museum has been divided into five sections. There are exhibits on the first floor portraying the techniques and traditions of the fishermen in Macau. These exhibits include the displaying of fishing techniques, fishing boat models and costumes. On the second floor, the exhibits survey the history of the geographical discoveries and Portuguese explorations. While the top floor of this house exhibits the marine transport and technology, navigation and dredging. The exhibits also includes the Guia Lighthouse which was the first lighthouse of China, various types of ropes, three-dimensional model of Macau and the variety of boat models. The Aquarium Gallery of this museum has four tanks and each is devoted to a different theme of sub-water world. The first among these represent the fresh water river bed, second one a harbor and the third one a coral reef. The last tank features the sunken boat’s scenes in the deep sea. There is a square outside this museum which you should not miss. From there you can get the scenery of the river bank as well as that of the busy harbor. Sail boats are also available for you if you wish to sail in the sea. Kun Iam temple is one of the magnificent and more impressive temples of the Macau and the other two being A-Ma Temple and Lin Fung Temple or Lotus Temple. It has history which takes us back to as early as the year 1632 in the Ming dynasty. It has many similarities with that of the ancient Chinese temples. This temple is also famous as it was the site where the first Sino American Treaty was signed in the year 1844. Kun Iam Temple has mainly three shrines suited one behind the other. It also consists of the Hall of Sakyamuni, one Hall of Buddha of Longevity and Kum Iam hall having many small shrines around these three main halls. The Hall of Sakyamuni faces the gate of the Buddhist monastery and is dedicated with the three gilded statues. The statue of Sakyamuni sits in the middle. There is a bronze bell which is more than 300 years old hanging besides the hall. The Longevity hall is adorned by the Buddha of Longevity. Mild and serene, this statue is the symbol of purpose of Buddha for delivering all living creatures form torment. Kun Iam hall is the significant hall of the temple. Kun Iam is arrayed in embroidered silk and in crown it is flanked by eighteen Buddhas. It is said that one of them is to be carved in the image of Marco Polo who has studied Buddhism in this temple. There are terraced garden at the back of this temple. The first Sino-American treaty Wogn Ha or Wangxia Treaty was signed on one of the stone desks here. In addition to this, there are many calligraphic works here. You can also find some cultural relics which were brought together in this temple. This well decorated and furnished temple is worth a visit. Macau Wine Museum was inaugurated on the 25th December 1995 and aims at introducing the development of the brewing culture of wine to the visitors. This museum occupies an area of about 1400 square meter and has a collection of over 1115 brands of whines which includes 756 commercial and 359 collection wines and the Martle which was produced in the year 1815 and is the earliest one. This museum is divided into mainly three parts which combines the culture, education and amusement into a complete entity. This museum has area of history of wine making, that of wine display and the area of the collection of wines. Each of these sections systematically introduces the brewery, history of the tools and utensils as well as growth of grapes, present to the visitors the traditional and modern tools which are connected to the production of wine. Among some of the newly brewed wines, this museum offers you more than 50 varieties of wines for tasting and offers you a rare chance for experiencing the famous wine. This museum has another group of exhibits of porcelain bricks which are decorated with the colored drawings which belong to the 18th century. Some of which are original while other are the replicas. The drawings present on the bricks of porcelain concerns to the grape wine and vineyard. In addition to these, there is a set of mannequins displaying various regional dresses of different regions of Portugal. This museum will bring you in contact with the development in the wine brewery and the economical, social and cultural importance of wine in the tradition of Portuguese tradition, celebration rituals and daily life. This is the unique museum where you can get all the information related to wine and its development from the past to present day. This museum is inside the Macau Tourism Activities Centre. The Grand Prix Museum, Macau contains the exhibits related to the Grand Prix worldwide which includes videos, photos, illustrated articles, records of champions, cups and some commemorative items. It is located at the Tourism Activities Centre of Rua Luis Gonzaga Gomes. It was built in the memory of 40th anniversary of Grand Prix Racing in Macau in the Year 1933. The Macau Grand Prix has history of more than 50 years since 1954. This museum has many items which focus on the competition and is must see destination for all F1 enthusiasts. Having more than twenty formula motorcycles and formula cars which were once driven by world renowned drivers like Michael Schumacher, Eduarfo De Carvalho and David Coulthard are here on exhibition. The racing car which is placed in the centre of the hall is the most eye-catching one. It was once driven by one of the most famous car driver Aryton Senna, who died at 1994 San Marino GP. It is white and red Formula 3 racing car with his racing helmet and racing cloth displayed here. In addition to these things, there are projection Devices in the museum which will help you to understand the museum and the History of the Grand Prix racing competition in a better way. There are also some breathtaking scenes of GP in Macau as well as some other countries on display. If you are fascinate about the two racing car simulators which enables you experiencing the racing on the challenging track at a very high speed. This museum was renovated by the Macau Tourism Bureau in order for celebrating the 50th anniversary of the Macau Grand Prix. You can have basic knowledge as well as introduction of some great people who have made good contribution to the Macau Grand Prix and can be found easily in this museum. Lin Fung Temple along with the two other temples, A-Ma Temple and Kun lam Temple are the three most popular temples of Macau. Lin Fung Temple was built during the Ming Dynasty in the period of 1368 to 1644 and originally known as Tianfei Temple. The current architectural design of the building is the result of many constructions undertaken from the Qing Dynasty. The whole complex is consisting of a cluster of palaces. Tianhou Palace is the centre of the complex and is dedicated to Kwan-yin. The Palace of Emperor Wu is located to the left and the Renshou Palace or the Palace of Benevolence and Longevity is located in the right of the Tianhou Palace. Shennong Palace, Yiling Palace, Doumu Palace and Juyong Palace are also parts of the complex. There is a spacious square in the front of the Lin Fung Temple which is surrounded by stone enclosures. Various ancient tree with thick leaves grow in the square. There is a small garden having pavilions, grass and flower behind the temple. In addition to this, there is a lotus pond in the temple itself. During the summer time, the pond is flourished with fragrant flowers and green leaves. Behind the lotus pond, there is a screen which is decorated with the giant cyprinoids and writhing dragons. The Temple of Lin Fung is worth visiting because of the Lin Zexu, the national hero and the arrivals of Chinese mandarins. In the year 1839, Lin Xexu stayed in this temple and interviewed the officials of Macau and Portugal. It was this place where he had prohibited the opium trade completely. In commemoration, a stone of Lin Zexu stand there which is about three meters or ten feet in height. The Memorial Hall of Lin Zexu was established in November 1997, next to the Tianhou Palace for praising his nobility and loyalty. The Portuguese began settling and trading in the southwest part of the Macau peninsula in the middle of 16th century. As a sub-sequence, Macau developed into an important port in China open to outside world before the 19th century and an important port in Asia. Having its prosperity in the international trade, it attracted many people for settling here from different countries of the world. These people in turn brought different social customs, cultures and regions to this area and they built houses, streets, fort and churches. This area is the core part of what is now known as Historic Center of Macau. These People at the same time introduced the culture, religion and social customs to the Chinese people. Macau was the window through which the foreign countries get to know about China. Since then the Macau has become the place where China meets the cultures of the western world. Macau has been the place where the cultures from East and West exchanges for over 400 years. You can find the best preserved and oldest western style buildings having different architectural styles emerging after the Renaissance from the neo-classical to Baroque. You can also find many western religious buildings exhibiting various features of different religions. The architecture of these buildings absorbed the cultures of China and India and added the characteristics into these buildings. You can also find the murals in the Guia Chapel painted in Chinese styles. The residential buildings and temples make the architectural style of the Historic Center diverse. Till date, the people of this area have their own habits and believe. They also continued to have their own traditions and celebrations which combine the western and Chinese elements and cultures. You can find much Portuguese non-religious architecture, some Chinese residential, some churches and religious buildings and streets and squares connecting them. There are various buildings, walls, forts, churches and temples. The Historic Center of Macau provides a proof of the exchange of western culture, religious influence and architecture between East and West. Is unique value has made it listed in the World Cultural and Natural Heritage site in the year 2005. Macau Tower is one of the important landmarks of Macau. It was designed by the famous architecture of New Zealand, Gordon Moller. Its construction finished in December, 2001 at the 2nd year anniversary of return of Macau. This tower was the eight highest towers in Asia and tenth highest tower of the world in the year of its completion. Macau Tower is also the member of the World Federation of Great Towers. Macau tower attracts about 1 million people in a year. Macau Tower is about 338 meters or 1,100 feet above the ground. The Outdoor Observation Deck on Level61 is the highest observation level having a height of about 732 feet or 223 meters. You can get the panoramic view of the Peal River Delta, Taipa, Coloane Islands and Macau Peninsula while walking around the Observation Deck. The Observation lounge is on Level58. This is the fascinating place for seeing the sunset in the morning or the spectacular night view of Macau. You can see East and West Mangyang Hill, Casino Lisboa and outlying islands of Hong Kong in sunny days on looking down. You can stand at a height of 100 meters or climb up to the top of the tower. You will be at the highest point of Macau at that time and it will be a special memory for you when you will be seeing at Macau in a completely different scene. You can also have Bungee Jump although you have played it several times but this one will be the highest in the world. By jumping up and down for about 223 meters you have the chance for renewing the Guinness record. You can also walk on the out rim which is 223 meters above the ground and having no hand rail which is another experience on the Macau Tower. The conference center on this tower has all the facilities like seminar, art performance, private occasions or meetings. It is also equipped with Theater, auditorium and banquet hall. Monte Fort is also referred to as Fortaleza do Monte or Mount Fortress and it is the historical military center of Macau. It lies to the east of the Ruins of St. Paul’s and originally belonged to the St. Paul’s Church. It used to defend the church from the Pirates. It is a UNESCO World Heritage Site, also a part of “Historic Center of Macau”. It was originally built in 16th century by the Jesuits and is one of the oldest forts. This fort was the principal military defense structure of city and crucial in successfully holding of the attempt of Dutch invasion in Macao in the year 1622. This fortress was equipped with military barracks, cannons, well and arsenal holding sufficient supplies and ammunition for enduring a siege lasting up to two years. It is build on the Mount Hill which is about 52 meters above the sea level. Monte Fort covers an area of about eight thousand square meters and in the shape of trapezoid. Its four corners protrude to form the bulwarks. The south-eastern, south-western and north eastern walls are built on about 4 meter wide granite bases. These walls are made up of solid rammed earth and strengthened further by thick stucco of ground oyster shells. 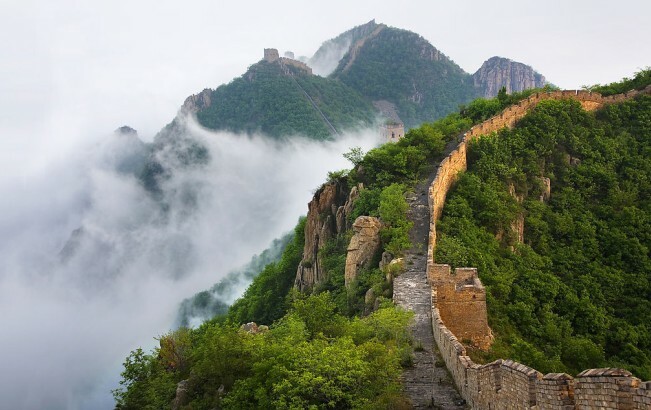 These walls face the Chinese Mainland do not have any battlement which indicates that this fortress was build only for the defense against the attacks from the sea side. This design inspired the authorities of Southern China to start building the similar kind of fortresses for defending their extensive coastline. You can get the spectacular panoramic view of the city by visiting this old fort. There is a tree covered park which offers a nice place for sitting and resting to enjoy the views. The Museum of Macau or the Museu de Macau was built on this hill in the 1990s. The Ruins of St Paul’s is also known as Sam Ba Sing Tzik and stands adjacent to the famous Macau Museum and Mount Fortress. The grand stone stairs and the front façade are only remains of the greatest church in Macau. St. Paul’s Church was constructed in the year 1580 and caught fire in the year 1595 and 1601. However, the construction again started soon after this church was burnt down in the year 1602. After its completion in 1637, it became the biggest Catholic Church of East Asia at that time. But, unfortunately due to a violent typhoon hitting Macau in 1835 the church caught fire for the third time and left its glory a history. According to the historic materials, this church was build with the white stones and had grand vaulted roofs. It also had three beautifully decorated halls. Sam Ba Sing Tzik was built using granites and has baroque façade which are rich in ornamentation having classic oriental characteristics. This structure has five tiers from bottom up. The first tire is made up of tem Ionic columns having three entrances. The entrance in the middle has MATER DEI carved into it. The two entrances on each of its side are decorated using bas-reliefs in the pattern of ‘HIS’. The second tire is featuring ten Corinthian columns having three windows. A Catholic Saint is enshrined in four tabernacles between the columns. The tow tier is said to represent the activities of missionaries and the Society of Jesus. The other three tiers are most decorated. The Statue of Madonna is standing in the middle of the third tire and the statue of Jesus stands on the fourth. The walls are fully covered with bas-reliefs having various patterns like angles, devils, a Portuguese sailing ship, symbols of crucifixion, etc. The Triangular combination of upper three tires reflects Holy Trinity and the Blessed Virgin Mary. There is a cross standing at the coping of the Wall. The Ruins of St. Paul’s have been stored during the year 1990 and 1995. One Museum that is Museum of Sacred Art and Crypt was also build during that time. It exhibits some religion artworks like sculptures, paintings and statues. The Thousand Islets Lake is characterized by deep water, whose average depth is 34 meters and the deepest is 108 meters, and there are 1078 islets on the lake, showing as the branches of the type for the travelers. There are a plenty of scenery resources in the Thousand Lake with rich type, excellent quality and wide distribution. You will see the vast green waves and clear waters in front of you when standing there. You can also view different appearance of the Thousand Lake and deep and serene harbour as all islets in the lake, no matter big or small, are featured various shapes and the distribution of the islands are set in order though there are sparse and dense. You will see the lake surface wide, profound and expanse as the sea surface in the sparse islands, whose harbour are deep and various and scenery are bright and colorful. Besides, you will also find the luxuriant forests and various animals and spectacular scenery there. Moreover, the geomorphologic landscape are also abundant. There including limestone, Danxia landform, thin layers of limestone, granite and so on, which make the creek valley and the pungam add radiance and beauty to each other. Travel information: 1) Opening time: 8:00 a.m.—16:30 p.m. 2) Ticket price: 150 RMB / adult in the peak season and 120 RMB /adult in the slack season. 3) Duration suggestion : 1-2 days. 4) Best time to visit: September – November. 5) Ways to go there: take the bus through the 320 national highway from Hangzhou to the Chunan County with 2.5 drive.